In March of 2017, Washington State Governor Jay Inslee discussed soil health and farming in the state of Washington. “One of the great blessings of the state of Washington is our farmland and preserving it is not only iconic for the state of Washington but necessary for our survival economically.” Says Governor Inslee in his opening remarks. If you do not want to watch the entire session, you can skip ahead. The section about soils starts at 19.28 and runs through 22.24. Thank you to Results Washington and TVW for supplying the video. 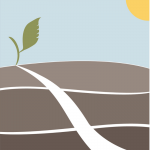 The Washington Soil Health Committee is announcing the availability of competitive grants to stimulate the development and adoption of innovative approaches and technologies related to Soil Health on Washington agricultural and forest lands lands, as defined below. Proposals will be accepted from eligible entities in Washington State. The Soil Health Committee anticipates that the amount of funding available for support will be up to $10,000 per year for each approved proposal, subject to appropriations actions. Proposals for competitive consideration of grant awards for single or multi-year projects not to exceed 3 years in duration are requested for projects that focus on innovation, resource assessment, research, education, and public outreach. Proposals will be considered from conservation districts, non-profit organizations, governmental entities, and landowners. For complete information and to apply, see this document.